Introduction: The objective of this study was to compare three capsaicin extraction methods: Shoxlet, Ultrasound-assisted Extraction (UAE), and Shaker-assisted Extraction (SAE) from Habanero pepper, CNPH 15.192. Materials and Methods: The different parameters evaluated were alcohol degree, time extraction, and solid–solvent ratio using response surface methodology (RSM). Results: The three parameters found significant (p < 0.05) were for UAE and solvent concentration and extraction time for SAE. The optimum conditions for the capsaicin UAE and SAE were similar 95% alcohol degree, 30 minutes and solid–liquid ratio 2 mg/mL. The Soxhlet increased the extraction in 10–25%; however, long extraction times (45 minutes) degraded 2% capsaicin. Conclusion: The extraction of capsaicin was influenced by extraction method and by the operating conditions chosen. The optimized conditions provided savings of time, solvent, and herbal material. Prudent choice of the extraction method is essential to ensure optimal yield of extract, thereby making the study relevant and the knowledge gained useful for further exploitation and application of this resource. Abbreviations used: Nomenclature UAE: Ultrasound-assisted Extraction; SAE: Shaker-assisted Extraction. Box-Behnken design indicates to be useful to explore the best conditions of ultrasound assisted extraction of capsaicin. Capsicum spp is a consumed and appreciated for its pungency color, and flavor aroma, also for the biological activities such as anti-inflammatory, antioxidant, and hypocholesterolemic . The genus Capsicum comprises five domesticated species: C. annuum, C. baccatum, C. chinense, C. frutescens, and C. pubescens. and contain different amounts of capsaicinoids, carotenoids, vitamins, and flavonoids. Capsaicinoids are the principal secondary metabolites responsible for the pungency of Capsicum chili pepper fruit and biological activities of Capsicum chili,,. This class of compounds possesses more than 50 capsaicinoids, which can be identified and quantified by HPLC, HPLC-MS, GC and GC-MS.
Embrapa vegetable crops have an important Capsicum breeding program that has focused on the development of habanero-type cultivars (C. chinense, line CNPH 15.192). This cultivar has the characteristic of having high level of pungency capsaicin, which makes it promising for use in foods and medicines. However, the development and efficient capsaicin extraction method for pharmaceutical and alimentary industry depends on method, herbal material, and optimization technique. Thus, the present study aimed to evaluate and optimize different capsaicin extraction methods, prioritizing operational versatility and low toxicity solvent extractors. The capsaicin standard used was purchased from USP Reference Standards (Philadelphia, PA, USA). All other chemical reagents were HPLC grade. Habanero pepper, line CNPH 15.192, was provided by Embrapa Vegetables, Brasilia-DF. Mature fruits were cleaned and had the peduncle removed. They were then stabilized and dried in an oven with forced air circulation at 40°C for 48 hours. Dried fruit were ground in a knife mill TE-625 (Tecnal Ltda, Piracicaba, SP, Brazil) and the powder was stored at –4°C. Capsaicin was identified and quantified by HPLC (Waters®.e2695) method. The separation method used C18 column, from Agilent Technologies® (USA) (250 mm × 4.6 mm i.d. × 5 μm particle size). Chromatographic system was performed with solvent acetonitrile, methanol, and water (5:3:2) at a flow rate of 1 mL/min. The separated capsaicin peak was identified by comparing the individual standard with the retention time and the UV 229 nm spectra. The methodology was validated in accordance to. UEA was performed in an ultrasonic cleaner bath (UNIQUE® USC 4800, 40 KHz) and SAE was carried out in a shaker (novatecnica, NT 155). The extractions were performed in volumetric flasks (5 mL) with different hydroethanolic mixtures. A previous study of stability (n = 3) was done with standard of capsaicin solution (1.5 mg/mL), which was kept for 15, 30, 45, and 60 minutes in an ultrasound bath at 37°C (USC 1400, Unique®), shaker (Novatecnica®, NT 155) or Soxhlet at 90°C. A control solution (free extraction) in the same concentration was made and the areas of chemical marker were compared by HPLC. Two grams of dehydrated Habanero pepper fruit line CNPH(CNPH 15.192) pepper were placed in a Whatman 25 × 100 mm cellulose thimble. 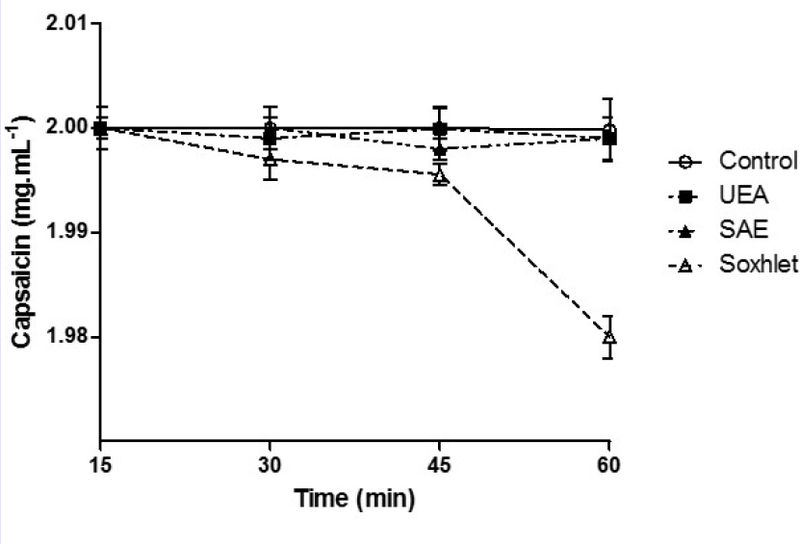 The extraction using Shoxlet at 90° C method (n = 3) was carried with 100 mL of ethanol 95% (vol/vol) with 5 cycles at 45 minutes each. The extract obtained was concentrated using a vacuum rotatory evaporator at 40°C. The dried extract was analyzed by HPLC. Table 1: Level of factors chosen for the trials. Where y is the capsaicin contents response variable, and (xi) are the selected parameters to model the response. The parameters analyzed were extraction time (x1), alcohol degree (x2), and solid to solvent ratio (x3). The various β´s represent the coefficients of the model. The two-factor interaction term βij represents either synergistic or antagonistic effects in the capsaicin extraction process. All the calculations were carried out using Design-Expert®version 7.0.0. To verify the predictive capability of the model, optimum conditions were established by RSM and comparisons between the predicted results and the practical values were carried out by experimental repetition using presumed optimal conditions. The Soxhlet extraction was performed with 2 mg/mL of herbal material by 30 minutes, with ethanol 95%. The system suitability parameters were in accordance with the literature specifications [Table 2]. The HPLC method proved to be capable of providing data of acceptable quality, performing the selectivity test, linearity, precision, and accuracy. [Table 3] highlights the values obtained from method validation; the calibration curves showed a linear response (0.5-40 μg/mL), obtaining correlation coefficients (r) 0.999. The LOD (0.22 μg/mL) and LOQ (0.34 μg/mL) showed that the present method is adequate and has the sensitivity to detect and quantify of capsaicin from H. pepper (CNPH 15.192). 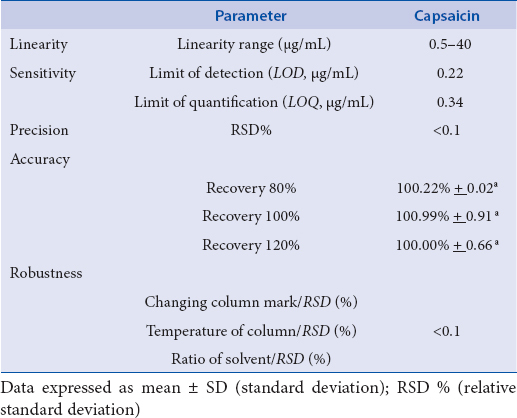 Table 3: Validation parameters values obtained from HPLC-PDA method for the determination of capsaicin from H. pepper (CNPH 15.192). The stability study showed that capsaicin content was not altered by the action of UEA or SEA [Figure 1]; there was a range of <0.25% between the sample content and the control. However, the extraction by Soxhlet degraded 2% of capsaicin after 45 minutes of extraction. The total capsaicin content extracted by Soxhlet (exhaustion process) showed that H. pepper has 2.2% (22.0 mg/g) of capsaicin. 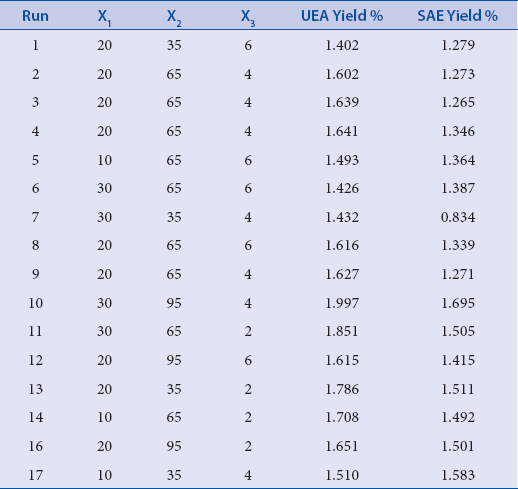 The UEA recovered 90.7% (14.2–19.9 mg/g) and SAE 76.1% (8.3–16.9 mg/g) [Table 4]. The higher extraction yield obtained by the Soxhlet is attributed to high extraction time, temperature, and drug solvent ratio. These factors increase the solubility of capsaicin. This method demanded a long extraction time (225 minutes), a large volume of solvent (500 mL) and degraded the sample. Although UEA and SEA extracted less capsaicin (9.3–23.9% less) they did save 86% of extraction time and 99% of solvent. Table 4: Box-Behnken 33 design and observed responses. The UEA recovered 15–41.5% more capsaicin than the SEA method [Table 4]. The higher extraction yield obtained by the UEA is attributed to the effects of acoustic cavitations in the solvent, which were produced by ultrasonic waves. The waves also exert a mechanical effect, increasing the penetration of the solvent into the herbal matrix and the contact surface between the solid and liquid phases.,, The RSM showed that the X1.X2.X3, X1.X2 and X2.X3 had significant (p < 0.05) effect on UEA process and X2 and X1.X2 on SAE [Table 5]. [Figure 2]a, [Figure 2]b, and [Figure 3] show that high level of extraction time (X1), alcohol degree (X2), and drug solvent ratio (X3) increase the extraction of capsaicin in both the extraction methods. Table 5: Summary of factors, effects and significances (p) ANOVA of UEA and SEA. 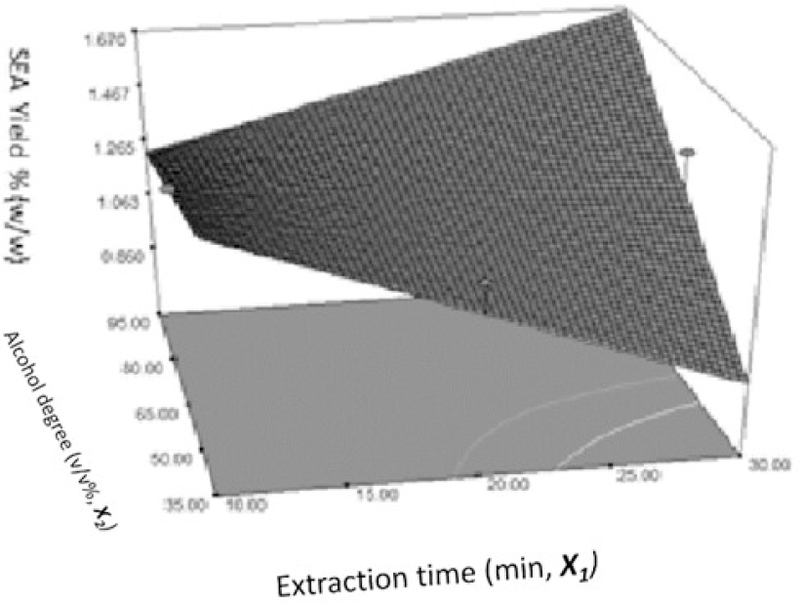 Figure 2: Response-surface graphs representing the UEA effect on extraction of capsaicin. The optimal theoretical extraction parameters for capsaicin (2.0% to UAE and 1.70% to SEA) calculated by RSM were similar in both methods of extraction, 30 minutes of extraction time, 2 mg/mL of herbal material, and 95% of alcohol degree [Figure 2] and [Figure 3]. Tests were conducted again in triplicate and showed that the capsaicin contents obtained from extraction under optimal conditions were 2.09 + 0.05% wt/wt (n = 3) to UEA and 1.71 ± 0.06% wt/wt (n = 3) to SEA. The good correlation between the theoretical results and the reexamined values confirmed that the response model represented the expected optimization well (Equation 1 and Equation 2, uncoded values). The extraction of capsaicin was influenced by extraction method and by the operating conditions chosen. The optimized conditions provided saving of time, solvent, and herbal material. Prudent choice of the extraction method is essential to ensure optimal yield of extract; thereby making the study relevant and the knowledge gained useful for further exploitation and application of this resource. The authors gratefully acknowledge the CAPES, CNPq, and EMBRAPA. Aranoff SL, Pearson DR, Okun DT, Lane CR, Williamson IA, Pinkert DA, Monitoring of U. S. Imports of Peppers. US. International Trade Commission 2008;4:332. Demirbilek S, Ersoy MO, Demirbilek S, Karaman A, Gürbüz N, Bayraktar N, Small-dose capsaicin reduces systemic inflammatory responses in septic rats. Anesthesia and Analgesia 2004;99:1501-7. Menichini F, Tundis R, Bonesi M, Loizzo M, Conforti F, Statti G, The influence of fruit ripening on the phytochemical content and biological activity of Capsicum chinense Jacq. cv Habanero. Food Chemistry 2009;114:553-60. Alvarez-Parrilla E, de la Rosa LA, Amarowicz R, Shahidi F, Protective effect of fresh and processed Jalapeño and Serrano peppers against food lipid and human LDL cholesterol oxidation. Food Chemistry 2012;133:827-34. Pickersgill B, Genetic resources and breeding of Capsicum spp. Euphytica 1997;96:129-33. Perucka I, Oleszek W, Extraction and determination of capsaicinoids in fruit of hot pepper Capsicum annuum L. by spectrophotometry and high-performance liquid chromatography. Food Chemistry 2000;71:287-91. Schweiggert U, Carle R, Schieber A, Characterization of major and minor capsaicinoids and related compounds in chili pods (Capsicum frutescens L.) by high-performance liquid chromatography/atmospheric pressure chemical ionization mass spectrometry. Analytica Chimica Acta 2006;557:236-44. Al Othman ZA, Ahmed YB, Habila MA, Ghafar AA, Determination of capsaicin and dihydrocapsaicin in Capsicum fruit samples using high performance liquid chromatography. Molecules 2011;16:8919-29. Chinn MS, Sharma-Shivappa RR, Cotter JL, Solvent extraction and quantification of capsaicinoids from Capsicum chinense. Food and Bioproducts Processing 2011;89:340-5. Gao L, Mazza G, Extraction of anthocyanin pigments from purple sunflower hulls. Journal of Food Science 1996;61:600-3. Martins FSM, Cardoso EC, Evaluation of extraction method on the chemical composition in Apeiba tibourbou Aubl s extracts. Pharmacognosy Magazine 2015;11:368-73. Martins FS, Conceição EC, Bandeira ES, Costa RMR, Silva JOC, The effects of extraction method on recovery rutin from Calendula officinalis L (Asteraceae). Pharmacognosy Magazine 2014;10:569-73. Wu Y, Cui SW, Tang J, Gu X, Optimization of extraction process of crude polysaccharides from boat-fruited sterculia seeds by response surface methodology. Food Chemistry 2007;105:1599-605. Martins FS, Borges LL, Paula JR, Conceição EC, Impact of different extraction methods on the quality of Dipteryx alata extracts. Revista Brasileira de Farmacognosia 2013;23:521-6. USP (2011) United States Pharmacopeial Convention. Rockville. Stat-Ease IM, (2005) Design-ExpertMinneapolis, MN, USA, 70.0. Zhang H-F, Yang X-H, Zhao L-D, Wang Y, Ultrasonic-assisted extraction of epimedin C from fresh leaves of Epimedium and extraction mechanism. Innovative Food Science & Emerging Technologies 2009;10:54-60. Lianfu Z, Zelong L, Optimization and comparison of ultrasound/microwave assisted extraction (UMAE) and ultrasonic assisted extraction (UAE) of lycopene from tomatoes. Ultrasonics Sonochemistry 2008;15:731-7. Riera E, Gallego-Juárez JA, Mason TJ, Airborne ultrasound for the precipitation of smokes and powders and the destruction of foams. Ultrasonics Sonochemistry 2006;13:107-16. Huang W, Xue A, Niu H, Jia Z, Wang JW, Optimised ultrasonic-assisted extraction of flavonoids from Folium eucommiae and evaluation of antioxidant activity in multi-test systems in vitro. Food Chemistry 2009;114:1147-54. Wang LZ, Yang B, Du XQ, Yi C, Optimisation of supercritical fluid extraction of flavonoids from Pueraria lobata. Food Chemistry 2008;108:737-41. Gonze E, Fourel L, Gonthier Y, Boldo P, Bernis A, Wastewater pretreatment with ultrasonic irradiation to reduce toxicity. Chemical Engineering Journal 1999;73:93-100. Schläfer O, Onyeche T, Bormann H, Schröder C, Sievers M, Ultrasound stimulation of micro-organisms for enhanced biodegradation. Ultrasonics 2002;40:25-9. Yosef E, Ben-Ghedalia D, Miron J, Huttermann A, Majcherczyk A, Milstein O, Characterization of some cell wall components of untreated and ozone-treated cotton stalks. Journal of Agricultural and Food Chemistry 1994;42:86-90.